We run educational sessions where we will visit your school bringing along a selection of reptiles, invertibrates, amphibians and birds. We can adapt to suit the different Key Stages and bring animals that suit. Due to the nature of the animals being cold blooded we only work them off site for a max of 3 hours. School visits for half days are £180 One off group visits for Scouts, guides or community groups will be £120. Travel costs may occur if outside of our area. Going away and no one will look after your reptiles? Not a problem, we can accomodate snakes from hatchling size to 14ft pythons. Lizards, turtles, spiders and even the small furries. All animals are health checked upon booking in and are kept in a seperate holiday boarding section of the shop. Prices start at £1 per day. Ring us for a quote an availablity. BOOK EARLY DURING SCHOOL HOLIDAYS!! 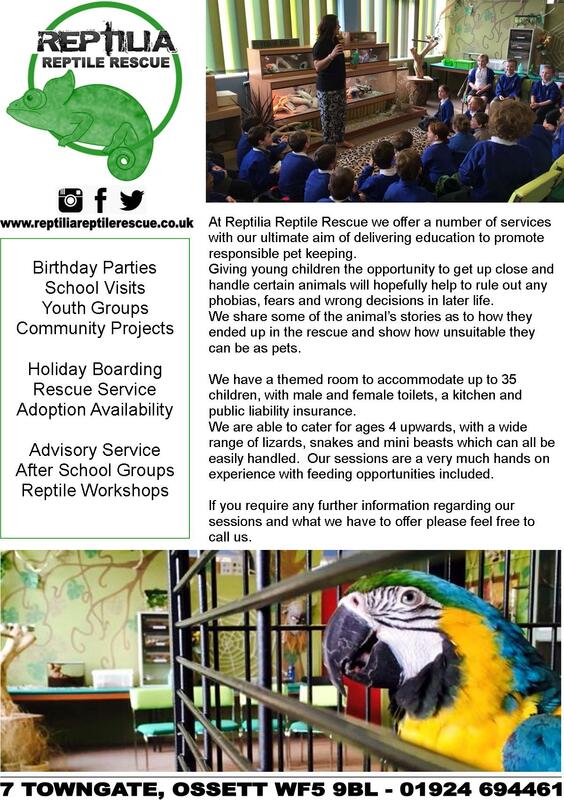 During school holidays we run reptile workshops which gives anyone intrested in reptiles the opportunity to come along for a 2 hour session for an introduction into reptiles. Feed and handle a variety of different reptiles. Places are £10 per person. Ring us for bookings and be quick as these are in huge demand and places are limited. To discuss any of the above ring: 01924 694461 and speak to staff who will be able to answer your questions and book your place.